Pine Valley is so hard there are legendary stories about the course. Some certainly are true and some are probably just urban legend. Some of my favorites are the player who went out in 38 on the first nine and then took a 38 on the 10th hole; Professional Gene Littler’s 7 on the par 3 5th hole during Shell’s Wonderful World of Golf match in 1963; British writer Bernard Darwin who played the first 7 holes in even par and then after hitting a nice drive to the middle of the fairway on the 8th took a 16 for the hole. On a more positive note, in the knowing when to cut your losses department, we have Woodie Platt – an excellent amateur player in his day. 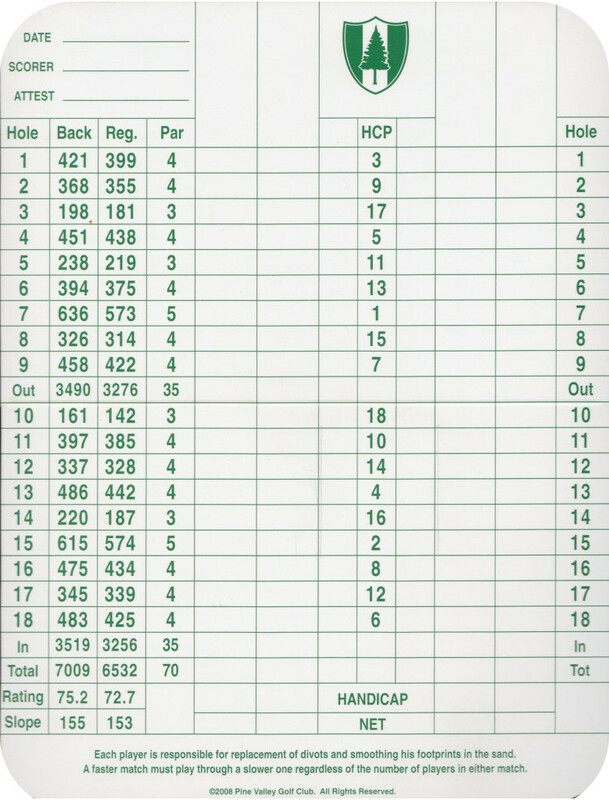 In the summer of 1951 he had the greatest start in the history of Pine Valley. He birdied the 1st hole, then holed his approach shot on the 2nd hole for an eagle. At the par 3 3rd hole he recorded a hole in one and then drained a putt for birdie on the 4th hole. Six under through 4 holes at Pine Valley is not too bad. In the short walk from the 4th green to the 5th tee box players walk right past the clubhouse. Woodie decided to go inside for a drink to help calm his nerves before carrying on his spectacular round at the par 3 226 yard 5th hole. He never came out of the clubhouse. He decided that it could only get worse and that he should quit while he was ahead. Can’t say I blame him. Some of you may be disappointed that I didn’t take any photos during the round. Let me say a couple of things about the lack of photos. First, this golf course is so hard that as a 16 handicapper it would have been a disservice to the course, an insult to my host and a thumbing of the nose to the great game of golf if I had done anything other than concentrate on making the necessary shots. Second, I felt just a little punch drunk by the entire experience. I was so busy taking it all in and absorbing the environment, I didn’t want to miss anything because I was busy snapping a picture. Third, Pine Valley enjoys their privacy and I was not 100% clear on their photo policy so I just left the camera at home. Sorry to my loyal readers who were looking forward to pictures. You’ll have to watch Ebay for the Pine Valley history book if you want to see the course or look for previously owned copies on Amazon here. Here is my brief summary of the #1 golf course in the world . . . it’s hard. With bunkers sporting the monikers “Hell’s Half Acre” and another one named after an unprintable part of the Devil’s anatomy I should have expected nothing less. The fairways are pretty generous and hitting them is not the real challenge here. It’s all about the second shot. You simply have very little margin for error on your approach shot. There are sand hazards and trees everywhere and if you get off track it can be very costly to get back on. On the par 3 3rd hole I hit my tee shot to the right. I reloaded with a provisional and hit it to about 15 feet. Stupidly, I went looking for the first ball because I didn’t want to take the stroke and distance penalty for a lost ball if I didn’t have to. Unfortunately for me I found the first ball which ended up being a much greater penalty as I carded a 7 after knocking a couple of shots around in the trees. Had I played my second ball I probably would not have done worse than a 5. My caddy Steve had an annoying habit of finding my wayward balls. I think he took pleasure in it. Late in the day we were in the woods looking for a ball for one of the players in our group (as we were on more than one occasion) and we found an abandoned ball that didn’t belong to any of us. I flipped at it with my wedge to knock it further down the hill and the ball hit a tree ricocheting deep into the woods. My caddy says “You even hit a tree with that shot”. It was just that kind of day. Another story to reiterate my point about running into trouble when you get off track is the par 5 15th hole. I hit a great drive to the middle of the fairway, a great second shot that left just 130 yards to the green from where my ball sat in the middle of the fairway. The lie for this third shot was a little above my feet and I squirted a 9 iron out to the right. 4 shots later I was on the green and then after I three-putted the green finally holed out for a 10. The course is hard. One other thing I thought was pretty cool was that there are actually houses inside the gates of Pine Valley scattered around the course. I only saw two of them, but apparently there are several more around the property. They are all very inconspicuous and if I hadn’t been so, um, how should we say it . . . off the beaten path . . . I never would have even seen them. At one point the homes were owned by companies that held corporate memberships at the club but when the corporate memberships were done away with the homes were sold to members of the club. Living on a house at Pine Valley brings golf course living to a whole new level! Yes, Pine Valley is tough, but it is fair and you most certainly can score on it if you hit your drives in position to be able to make good iron shots to the middle of the greens. A great golf course and certainly worthy of it’s high ranking . . . just don’t let it get in your head!